Using redi-made panels for drapery material is a genius idea because you can save a whole lot of money on fabric. On many occasions, I have purchased panels in my local store (mostly from Target and Pier 1 Imports) and have used them for making DecoWrap styles. Here is the thing, if you find a 54″ wide x 84″ drapery panel for $20.00, that is like getting your fabric for less than 10.00 a yard. Since DecoWrap requires 54″ wide fabric to cover the 40″ cornice, you can get two “cuts” of (54″ x 32″) out of one panel. 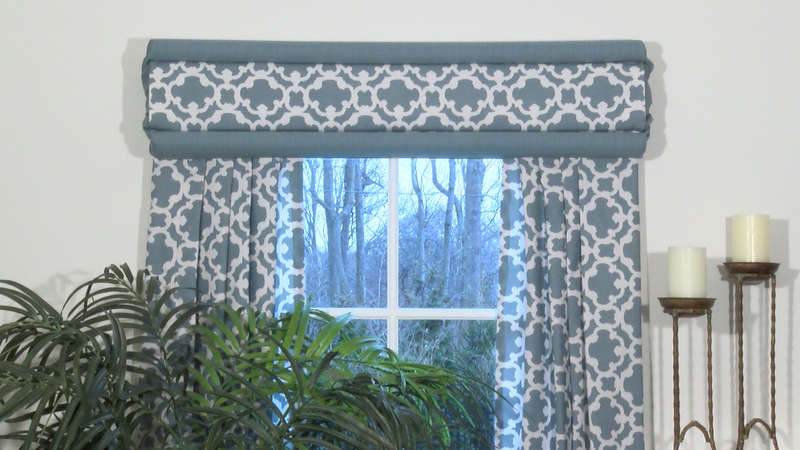 So one panel will cover both basic cornices included in our DecoWrap kit! Another bonus is that decorative drapery panels or sheers can just tuck into the back of the DecoWrap cornice forms. There is no need for an additional drapery rod. You can use one panel to cover the cornice, and two more can be tucked into the back slit of the DecoWrap. The panels hang down to frame out the window, creating a high-end custom look. Fabric shower curtains are also a great pre-made choice. My local Home Goods store had great patterns in nice weight cotton for 14.99! And shower curtain panels are large. You can see some styles I made for our QVC shows. The videos can be found on You Tube, the link is at the bottom. Look for the navy and white wide strip nautical roman style. Another is the grey and teal print with white panels. Have any questions or project ideas to share? We would love to hear from you!